Spray 4- to 5-quart slow cooker with cooking spray. In cooker, place onion and garlic. If beef roast comes in netting or is tied, do not remove; place beef on onion. Pour dressing over beef. Transfer beef to cutting board; remove netting if necessary. Cut beef into thin slices; return to cooker. Stir in pepperoncini. Increase heat setting to High. Cover; cook 15 minutes longer or until thoroughly heated. 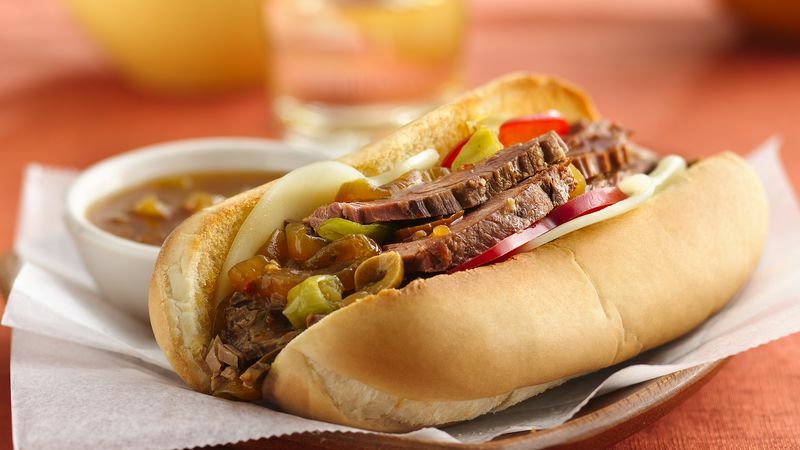 Spoon beef into toasted buns; top with bell pepper rings and cheese. Pour remaining liquid into 8 small custard cups; serve with sandwiches for dipping. Add some zing by spreading horseradish on buns before filling.